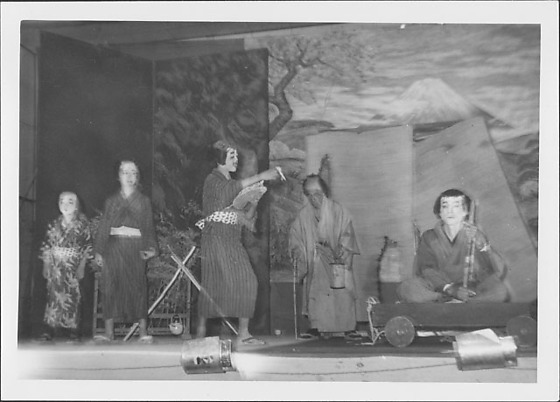 Man talks to man seated in "boat" during a Kabuki performance in Rohwer concentration camp, Rohwer, Arkansas. Young man in striped kimono, wig and makeup faces R as he holds up a white object toward man in kimono, wig and makeup holding a bamboo stick and seated on cart representing a boat. Two young actors in kimonos stand at L in background; actor hunched like old man with cane and lantern stands in background in front of torn screen. Mount Fuji backdrop.